As the "Harry Potter" series wraps up this month, it brings to an end the remarkable journey of a character that reached the Indian shores a little late but unleashed magic when it did. From Hindi, Malayalam, Marathi and Gujarat versions of the books to a home-grown school of magic, the child wizard has virtually single-handedly spawned a new industry in his name. Such is the Potter craze in India that the country has become a part of the book's global launch. The wizard's fate will be unveiled on July 21 with the release of "Harry Potter and the Deathly Hallows", the seventh and possibly last Potter book by J.K.Rowling. The stories of Harry Potter, unlike superheroes like "Spiderman" and "Batman", were well placed in tradition, conveying a moral, and touched a chord among Indians. "Like India's 'Panchatantra', 'Harry Potter' sends out a message of love, loyalty, fellow feeling and courage," said Neetu Kohli, a mother of two children. "My sons can learn values through Harry." Spinoffs like Potter glasses, videogames, clothing, toys and house-wares are now up for grabs. Also piggybacking on the Potter phenomenon is the country's master magician P.C. Sorcar Jr., who is set to open the Indian edition of Hogwarts School of Witchcraft and Wizardry, which will award master degrees in 'Dramagic' to its students. The first book, "Harry Potter and the Philosopher's Stone", arrived in India quietly and its appeal was restricted to just a section of urban children. As the sequel started gaining recognition worldwide and its reports reached India, curious readers picked it up. "I saw my friend reading 'Harry Potter'. I did not know what it was then and I borrowed it from him to read and I loved it," said 21-year-old Ravi Chandra. "Since then I have always bought the books and in fact have booked them before their release." Word of mouth contributed to making "Harry Potter" a roaring success in this country, attracting people from different age groups. Like the Beatles and Bob Dylan, "Harry Potter" was a classic case of a character or a product being immortalised by fans and not by marketers or distributors. Rowling, the first dollar billionaire author, had in 1996 sold its publishing rights to Bloomsbury Press for just $4,000. In "Deathly Hallows", Harry Potter is expected to die and thousands of fans worldwide have signed a petition "Save Harry! ", urging Rowling not to end the series. 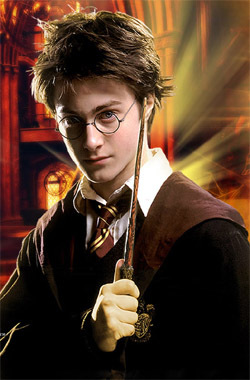 Indian fans too are apprehensive about Potter's fate and do not want his magic to end. Said 17-year-old Akash Gupta: "All of us want to enjoy more adventures from him. We want Harry to live on forever." More than 325 million copies of the first six books have been sold worldwide and it is being reported that the first print of "Deathly Hallows" is 12 million copies in the US alone. Amazon.com says nearly 1.6 million people worldwide have pre-ordered the final volume. India has booked 240,000 copies of the last book, which is priced at Rs.995 and the distributors expect the book to be sold out within the first three days of its launch. "There is around 15-20 percent growth in people buying Potter books. 'Harry Potter' is no longer just a children's book now. Possessing the first copies of the book is now a rage. People may not read it but they will surely keep it on their rack," said Rajiv Chowdhry, CEO of Oxford Bookstore, which has pre-ordered around 8,000 copies. "There is a lot of booking and we expect long queues outside the stalls from around 5 a.m. in the morning when the last book of the series is released." The publishing of Potter books in regional languages has prompted an anti-piracy drive through unleashing vigilance cells and intellectual property investigators. All the four Potter films have been hugely successful in the country and despite mixed reviews for the fifth, "Harry Potter and the Order of the Phoenix", movie tickets have been sold out till the middle of next week in most Indian theatres. "We are sold out till mid next week. We have been flooded by advance bookings and this is one film that the entire family is booking and coming to watch. This is rare for any film," said Shalu Sabharwal, vice-president, sales and marketing, PVR, India. Hall owners have also planned events for Potter fans to attract more and more kids at their cinemas. "We have installed games like the Wheel of Fortune through which we will be giving away a lot of prizes to children. Plus at the weekend, we have magicians to enthral people," Sabharwal added.